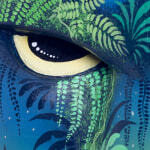 Selby Gardens Rainforest Mask Painting Class: Educational and Enchanting! The Rainforest Mask exhibit at Selby Gardens in Sarasota, FL offered so many opportunities to learn more about the beauty of Borucan culture. During the first week of the exhibit, three team members of Lucuma Designs took the opportunity to have their hands at mask painting. What did they think of the experience? During the three-week-long Rainforest Mask exhibit at Selby Gardens, hundreds of guests took the opportunity to vote for their favorite mask, artist, and carver. The mask artists made it quite difficult to choose, thanks to their talent, dedication, and immense effort this year. 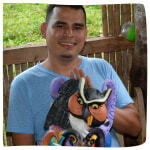 German has taught a few other mask carvers over the years, after learning his skills through his brother in 1998. 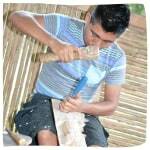 He proudly works with his fellow carvers in Taller Brún̈crin̈. 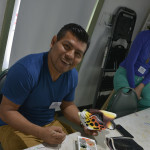 Emilio proudly creates his masks at Taller Brún̈crin̈ and has spent many years refining his art.